Moffat County High School's Ebawnee Smercina gets in a bump during the Lady Bulldogs' Saturday game against Gunnison. MCHS fell in three sets. Some slow reflexes made for a fast few sets Saturday during Moffat County High School volleyball’s game against Gunnison. The visiting Lady Cowboys swept the Bulldogs in three rounds with two 25-14 sets, wrapping up at 25-12. The hosts for the day had difficulty responding to Gunnison’s style of play, with their opponents getting plentiful points from serves that went unreturned, said coach Jessica Profumo. Reception errors were a headache, as was Gunnison’s leading outside hitter. “She pretty much put the ball wherever she wanted to put it,” Profumo said. MCHS girls claimed 10 kills, four of which were courtesy of Jaidyn Steele and three by Bailey Lawton. 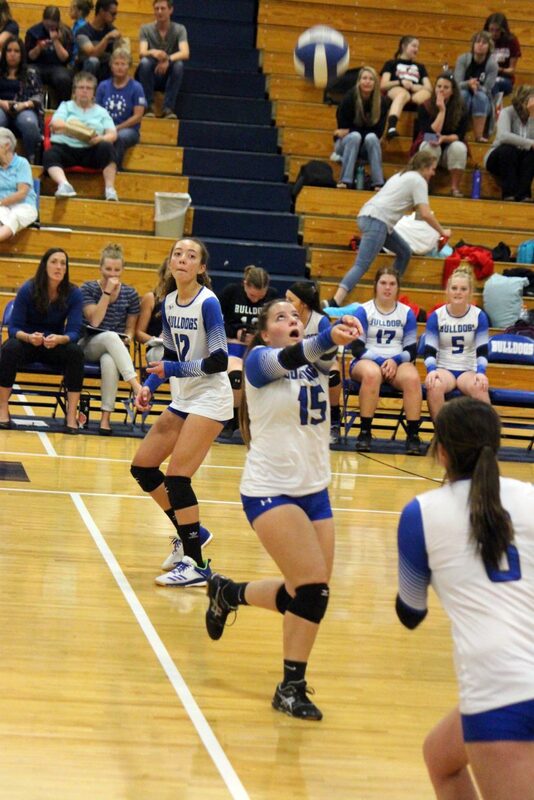 A tough day at the line amounted to 11 total service errors for Lady Dogs, though Hailee Herndon added two aces. Kenzie Rehor and Olivia Profumo each had seven successful digs and Lawton six to keep the ball alive. The coach credited the loss largely to a lack of focus leading up to MCHS Homecoming, the anticipation for which she hopes will dissipate once game time comes around again. On Thursday night, 4-8 Moffat County — ranked eighth in the 3A Western Slope League — hosts seventh-place Roaring Fork. A home game against Olathe follows the next day. “Roaring Fork should be really tough competition, and as long as they fight hard and don’t get discouraged on Thursday, we should be able to have an awesome game on Friday,” she said. With the Pirates sitting ninth in the 3A Western Slope League, the Olathe game will likely be the less challenging of the series but with Lady Bulldogs in eighth place and Roaring Fork seventh, Profumo doesn’t want any misconceptions that athletes should hold back Thursday for the sake of Friday.